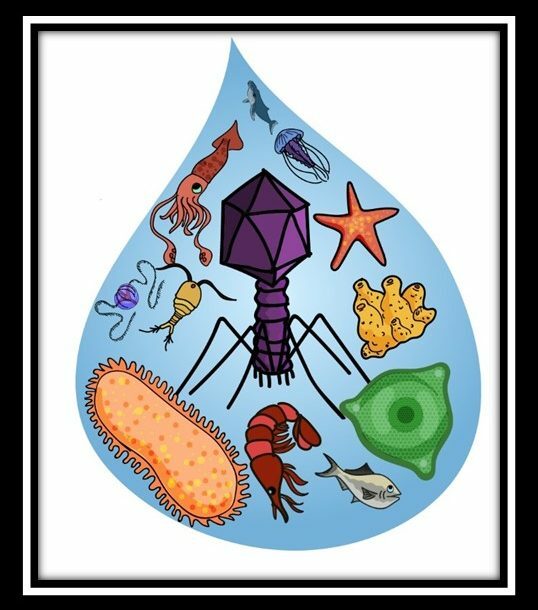 Viruses numerically dominate our oceans; however, we have only just begun to document the diversity, host range and infection dynamics of marine viruses, as well as the subsequent effects of infection on both host cell metabolism and oceanic biogeochemistry. Bacteriophages (that is, phages: viruses that infect bacteria) are highly abundant and are known to play critical roles in bacterial mortality, biogeochemical cycling and horizontal gene transfer. This Review Article summarizes current knowledge of marine viral ecology and highlights the importance of phage particles to the dissolved organic matter pool, as well as the complex interactions between phages and their bacterial hosts. We emphasize the newly recognized roles of phages as puppet masters of their bacterial hosts, where phages are capable of altering the metabolism of infected bacteria through the expression of auxiliary metabolic genes and the redirection of host gene expression patterns. Finally, we propose the ‘royal family model’ as a hypothesis to describe successional patterns of bacteria and phages over time in marine systems, where despite high richness and significant seasonal differences, only a small number of phages appear to continually dominate a given marine ecosystem. Although further testing is required, this model provides a framework for assessing the specificity and ecological consequences of phage–host dynamics.